You know what they say—behind every man is a great woman. 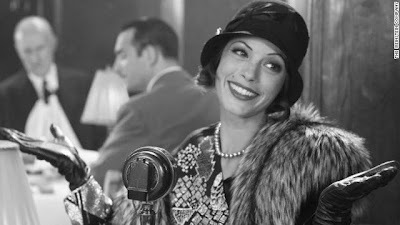 And that’s made evident in the 1920s nostalgia-soaked silent film, The Artist. Although the movie beautifully captures the difficult fall of silent film star George Valentin (Jean Dujardin) from Hollywoodland heavyweight to Hollywoodland has-been, the movie’s heart lies with his heroine, Peppy Miller (Bérénice Bejo). We first meet Peppy as a face in the crowd, scrambling to catch a glimpse of the one, the only George Valentin on the red carpet. Amid the glitz and glamour of the paparazzi swarming Hollywoodland’s biggest star, we see a “regular” girl. In fact, it’s Peppy’s ambiguity that sets her apart from said crowd. While all the other female fans are elbowing each other to get a chance to see their idol strike a pose on the red carpet, Peppy works her way to the front of the pack and just watches George, studying him. It’s like she sees the man behind the star, a man hidden from everyone else. A man she knocks off his feet. That’s the thing about Peppy—it’s her authenticity that charms audiences. Unlike George’s man-made celebrity, which seduces his loveliest fans, Peppy’s unflinching compassion for those around her downright enchants the audience. In that way, Peppy becomes George’s guardian angel. When his career begins to slide downhill, and his once marqueed name can’t even fill up a full row of seats at a theater, Peppy is the only one by his side, his number one fan when he has no one left. She picks him up when he hits rock bottom, when his pride stunts his career from forging ahead. As their careers see-saw one another, it is Peppy who remains the emotional compass throughout the entire film, the one who gets what George refuses to get. This natural clairvoyance propels her own film ambitions. Peppy’s career skyrockets into superstardom, but, with the exception of one significant scene where she tries to play up her career by essentially downplaying those who came before her (like George), she remains unaffected by the Hollywood allure. It’s fascinating to watch a charismatic leading lady remain grounded even after her career takes off. And it’s even more interesting to see her come to the rescue of her masculine counterpart, even if he did become a washed up star by the time of his rescuing. That’s something that would have never happened during the era the film is set in. In fact, Peppy would have more than likely have been drawn as a mere shallow competitor to George’s steadfast—however delusional—career. Since she was not written that way, it gives this wistful film the modern boost it needs to stand out. But The Artist doesn’t just paint Peppy as George Valentin’s superhero. Peppy is also a trailblazing woman on her own. Much like many George before her, she knows how to play to a crowd and to the hungry paparazzi. She became such a power player in Hollywood that she was able to negotiate George’s reacceptance into Tinseltown after threatening to drop out of a project herself. That’s major move for a film actress, a bold one her part (that ended up paying off). Peppy is that person you want in your corner—a bubbly (but not annoyingly so), impossibly adorable, smart, caring person with a good head on her shoulders. She never gets involved in any overblown scandal in order to get her name up in lights. She doesn’t sleep her way to the top of the Hollywood food chain. She never had to. All she was interested in was being a good friend, becoming an actor like her idol George, and spreading happiness to everyone along her path. This all plays to the deep complexities of her character, which go far beyond uplifting the lead male character. Peppy is a strong character by herself, without even relating to George. They are both equally rounded characters who supply the substance in a movie that’s heightened by their stories and the actors who play them. Their relationship helps stack every layer of this film, therefore elevating it past its seemingly cursory exterior. While we never really learn much information about Peppy’s background (she remains mostly anonymous on that front throughout the entire film), somehow we still feel as though she gives us a window to her soul. You relate to her, you empathize with her, and you cheer for her each time she steps in front of the camera. In short, Peppy has that likeability factor that fans crave. How can they not? She practically waltzes from scene to scene and, before we know it, we’re smitten by her magic. Although this season’s awards race may have you under the impression that Peppy is indeed a supporting character, Bejo’s performance of her will have you believing differently. Bejo brings out all the key qualities of Peppy in a performance that’s not only emotionally powerful, but also sentimentally resounding. Even in silence, you hear the tapping of her shoes, the pep in her step, and her infectious laugh. How can a film with no words emit such a roaring character? Put Bejo front and center and she becomes one with the music. Every sympathetic look, impossibly happy reaction and playful gesture becomes a full-fledged symphony with Bejo. She doesn’t need any words, because the audience just knows. And, you know what, she and us are right here. Too often people equate a good performance to one that’s grandiose, a powerhouse portrayal. Though some of those performances are in fact riveting, Bejo’s performance isn’t less so. She sparkles as Peppy, bringing out her magnetism as the gargantuan starlet she becomes, while also humanizing her and keeping her grounded. In other words, you take Peppy out of the City of Angels and she’d still be the same Peppy, girl wonder. Superhero to George Valentin, fallen star. Beautiful post! Peppy is such a great and strong character, I completely agree about her being a guardian angel. Bejo's performance is really incredibly beautiful. Excellent essay Candice, even though I haven't seen the film just yet it stokes my interest. I keep giving myself excuses not to go see The Artist, but damn this post is really making me change my mind! Great essay. I thought what brought The Artist into the 21st century was the strength of the Bejo character. Don't think you would see that in a silent film from the 20s. This is such a great post,I really enjoyed watching this film.